So I’ve spent the last ten minutes staring at a blank screen trying to decide what I could possibly contribute to anyone’s life by writing about the eight Harry Potter movies. This is the highest-grossing series of all time based on the best-selling book series of all time, an iconic pop culture franchise of ultra-scrutinized adaptations that pretty much everyone and their grandma has seen ten times. I suppose I could rank all eight movies, but this is a little bit harder than it looks. 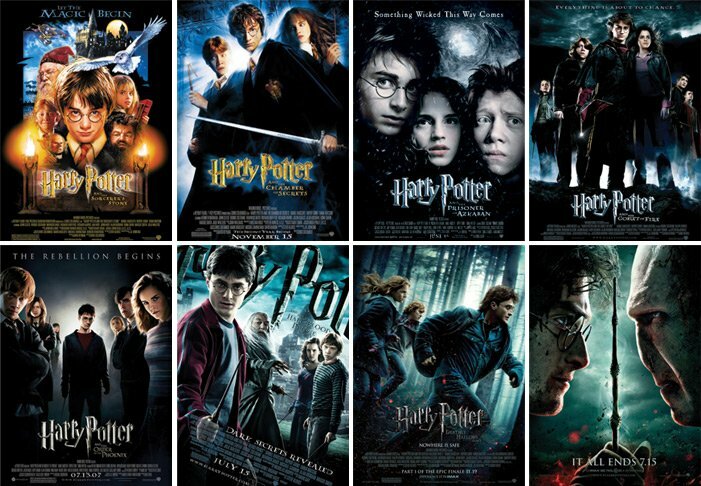 I don’t want to spend too long critiquing the stories and the characters of the Harry Potter series just yet (we’ll get there), and the best stories generally made the best movies. I could use this article as a referendum on the series’ faithfulness to the source material, but the only major complaints I’d make would be the Burrow burning down in Half-Blood Prince (what’s the point?) and the exclusion of the backstory on Moony, Wormtail, Padfoot, and Prongs in Azkaban. All of Hagrid’s first encounter with Harry is iconic. “Excuse me, but who are you?” and “You’re a wizard, Harry!” are two quotes the Internet loves to quote and gif and play with. But I just love the rapid-fire WTF of Hagrid storming in the hut, being friendly, doing magic, and overwhelming the Dursleys. Ollivander was always my favorite one-scene character in the Harry Potter universe before he prominently returned in Deathly Hallows. There’s something so enticing about a magic wand shop and a borderline-deranged magician who remembers every wand he’s made, every patron he’s had. The book had to tell you that this guy is creepy; the movie showed you. This has become THE iconic shot of the series. Chris Columbus, director of the first two films, wasn’t quite as good at capturing emotion or tension as his successors, but damn if he didn’t nail the aesthetics and images perfectly. The intra-Hogwarts competition stuff — prefects and Quidditch and the House Cup — ultimately proved trivial in the grand scheme of Harry’s saga, but it also gave us some of the most triumphant and emotional moments of the story. That moment when Neville gets ten points — fantastic. Alfonso Cuaron (did you forget he directed a Harry Potter movie?) ditched as much of the boarding school feeling as he could in the third movie, forgoing the Hogwarts uniforms and almost entirely removing Quidditch. Instead, he focuses on the creepy, mystical elements (and the Whomping Willow), with the spine-chilling entrance of the Dementors one of the series’ all-time iconic moments. The development of Ron and Hermione, both independently and as a romance, were definite highlights of the second half of the Harry Potter saga. The movies made their lives a little bit more soap opera-y than the books, but it by and large worked. One important moment was the Yule Ball, the first time Emma Watson’s attractiveness was really noted by the films, a point where her tension with Ron comes to a head, and the moment she transforms from girl to young woman. The unsettling resurrection of Voldemort was even creepier in the movies than in the book. I love the skeletal, serpentine look of Voldemort — something only partially human. Mike Newell only directed one movie, and had the burden of turning a huge (and troublesome) book into a good movie, but he did about as good a job as we could’ve expected. Umbridge is the third best villain of the series behind Snape and Voldemort — and I would even acknowledge the case that she’s more interesting and hateable than Voldy. Phoenix’s depiction of her was perfect, just as garish and vile as she is in the books (but even more pink). Maybe the comic highlight of the entire series. I still think Rupert Grint is the best actor of the three leads, here showcasing his fantastic comedy chops. Just a great, funny scene despite its abrupt turn towards danger at the end. The signature moment of the series, both in the books and films. While I think the “AVADA KEDAVRA” moment has more gravity in the book, the framing of the tower scene in the film is so tense and perfect. The reveal of Snape pointing his wand at Harry is gasp-worthy, and that slow-mo shot of a dead Dumbledore is, along with the end of the Game of Thrones pilot, my favorite fall from a tower in all of film. Everyone wondered if and how the movies would depict the Tale of the Three Brothers, and it’s hard to imagine a better adaptation than this spooky, mesmerizing animated version. Finally! The best kiss in the film series (here’s a recap), and one that had been built up to for a long time. I love how it starts so quickly. Great moment, great payoff. More on why Neville is probably my favorite character in the series in a later entry, but there’s no question he’s the real hero of Deathly Hallows Part 2. His slaying of Nagini is probably the most cheer-worthy moment of the series… they (we) definitely cheered in my theater at the midnight screening, at least. Also, amen to Helena Bonham Carter. Also, I discovered “Wizard People, Dear Reader” a few days ago and loved the first 10-15 minutes–must go back and watch the rest of it soon. Acceptable…provided “Harry Potter books” ranks higher (you seem to be hinting as much). Your takes on the films are very similar to my own – particularly your preference for Richard Harris as Dumbledore. He just did a better job of pulling off book Dumbledore’s blend of wise, ancient, powerful, and a little silly. I also loved the love potion scene (probably unlike a lot of folks, Book 6 just might be my favorite). They definitely worked in the most comedy in Half-Blood Prince, and for me it was a welcome reprieve between the teen angst of “Order” and the fighting-for-the-fate-of-the-world angst of “Hallows.” Pretty much the only thing I didn’t like was that Slughorn didn’t have his walrus moustache. It’s his one defining physical feature, and he didn’t have it. Maybe Jim Broadbent just didn’t feel like wearing it. Shame on you, Jim Broadbent. I thought the worst thing left OUT of the movies were the blast-ended screwts. They were the one magical creature I most wanted to see on the big screen, partially just to get a better understanding of what they looked like. In fact, the maze in “Goblet” was supposed to be full of all kinds of creatures, and they nixed them all. Instead, we just got “ooh, look, scary vines and…fog, I guess…”. It WAS a tiny consolation to get to see the school band in that scene (never alluded to in the books). I think if any of the books NEEDED to be split into two films, “Goblet” was the strongest candidate. They axed essentially the whole World Cup too. Final thought: I actually enjoyed the Deathly Hallows movies more than I did the book. In the book, we simply read over and over that “Harry and Hermione made camp, and Hermione cast the protective spells.” In the movie, I actually realized how much magic was going on, and it LOOKED magical. The book felt like kind of a slog to me (extended periods of dreary camping, and the sudden focus on “wand-lore” and the intricate rules behind wands changing hands). But the film brought the story to vivid life. Highlights: 1. McGonagall summoning the suits of armor (you know what a sucker I am for armies of ghost armor). 2. Filtch looking horrified in the aftermath of the battle, and then picking up a broom and “sweeping” uselessly at the edges of the rubble.